Today and tomorrow is your LAST CHANCE to take advantage of these amazing offers from Sanderson Ford! Remember, if you come in and take a test drive, Sanderson Ford will donate $100 (up to $10,000 total) to Southwest Autism Research and Resource Center (SARRC). There is only one test drive per person and you must be 18 years of age. By the time the dealership closes tomorrow, the following Sanderson Ford specials will be gone, so take advantage of them now! Interested in any of the above vehicles? Again, you only have until the close of the dealership tomorrow to lock in these great prices, so hurry in today! Check the website for more details! 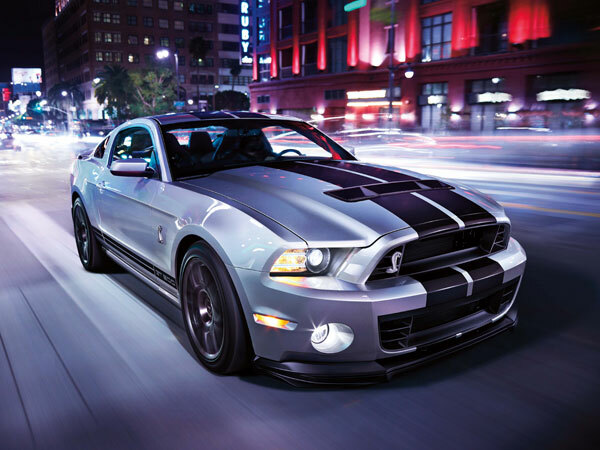 Sanderson Ford is all set to host the 2014 Detroit Muscle Car Show on Saturday, March 22, 2014! All American cars are welcome, with a limit of the first 210 entries into the show. If you haven’t registered yet and would like to, visit us here for the registration count! Pre-registration deadline Friday, March 14, 2014, the car entry fee is $20.00 for pre-registration ($25.00 after March 14th), and checks are payable to Wild West Mustangs. 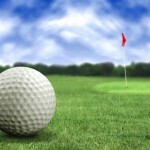 All proceeds benefit the local charity, Arizona Military Assistance Mission! All pre-registered participants will get a goodie bag, a dash plaque, and a t-shirt upon arrival and checking in. Please make sure you check the class that your vehicle falls under to avoid having to switch the class of vehicles when you arrive! All voting will be people’s choice and all results are final! Please come out to Sanderson Ford with your special American can and help support us support the Arizona Military Assistance Mission, and thank you to all that have already registered! Yep, you read that title right! 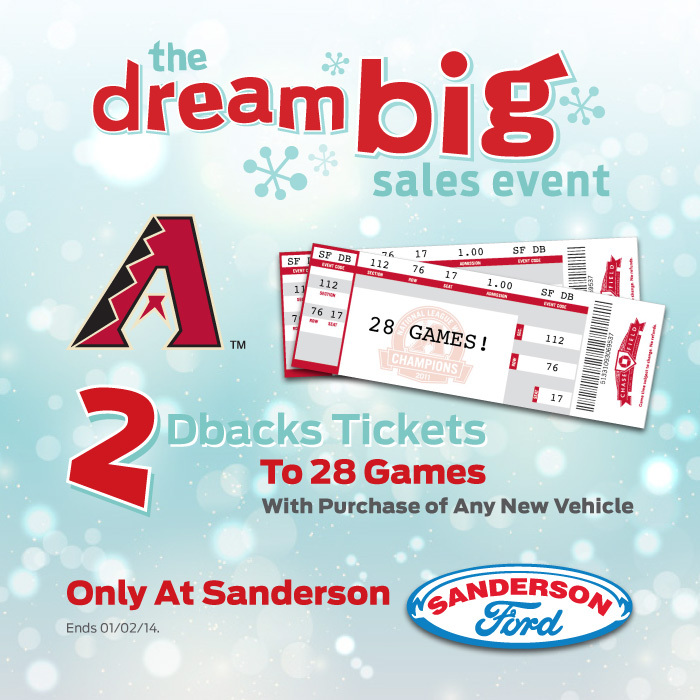 From now until the New Year, if you purchase a new Ford at Sanderson Ford, you will receive two Arizona Diamondback season tickets ! The package includes 28 games through the 2014 and 2015 Diamondback MLB season! The offer ends on December 31st and does not apply to A, X, Z, or D plans. 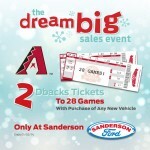 This exclusive offer is part of the Sanderson Ford Dream Big Sales Event that lasts until the New Year. 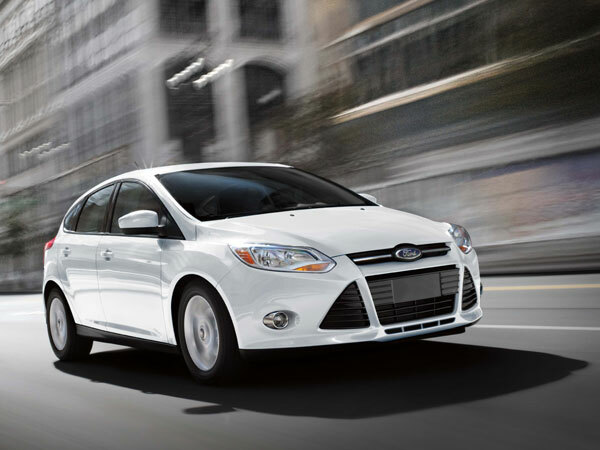 Customers can purchase several all-new Ford vehicles for a great price, including the 2014 Fiesta, 2014 Focus, 2014 Fusion, 2014 Mustang, 2014 Escape, and an array of best-selling 2013 models as well. Business owners! 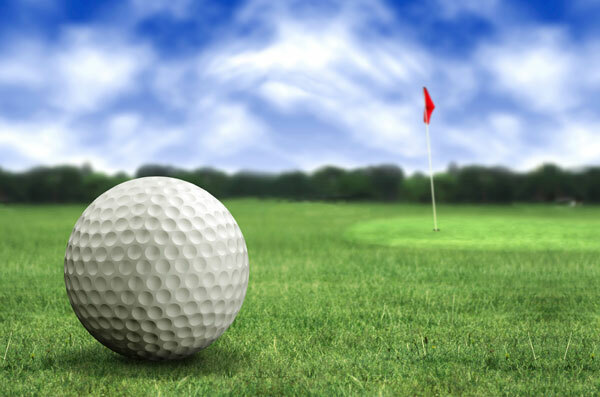 Take advantage of the Section 179 Tax Deduction before it expired on December 31st as well! This special stimulus tax allows up to 100% of an equipment purchase to be deducted on your business’s 2013 return. Swing by the Glendale, AZ dealership today and find out how your business can benefit from this deduction before it’s too late. 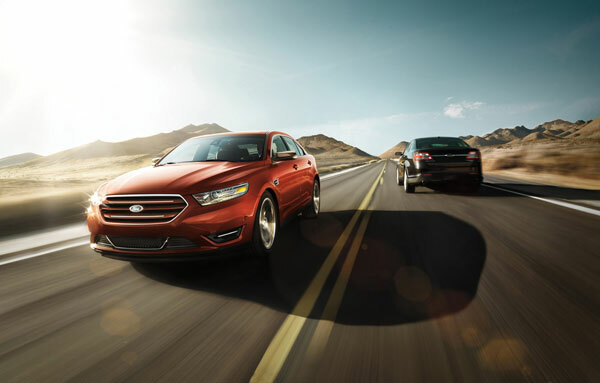 With so many exclusive offers available, it’s the perfect time to purchase a new Ford from Sanderson Ford! Stop by today! Yep, you read that right. Operation Santa Claus is big this year, just like before. Sanderson Ford, Sanderson Lincoln, and ABC15 are now offering YOU the chance to win a brand-new car or truck by donating to the 12th annual Operation Santa Claus. How to enter you ask? Easy. Drop off a new, unwrapped toy, children’s clothing item, packaged food item or simply a monetary donation to Sanderson Ford, Sanderson Lincoln, or ABC15 from now until December 19th. Local UPS stores will also take Operation Santa Claus donations. 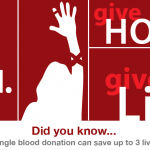 After donating, you will be entered to be one of the 15 finalists who have the chance to drive home a new Ford F-150 Super Crew Ecoboost or an all-new 2013 Lincoln MKZ. Each finalist will receive a $100 Visa Gift Card and a key. If you key starts the truck, it’s yours to drive home. Finalists will be drawn live ever Wednesday on ABC15’s Sonoran Living. 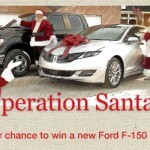 For more information on the car-giveaway, donations, or the 12th annual Operation Santa Claus, visit GiveToTheClaus.com or swing by Sanderson Ford. Help us provide Christmas cheer to those less fortunate in the area. Oh, and you could drive home a brand new car. 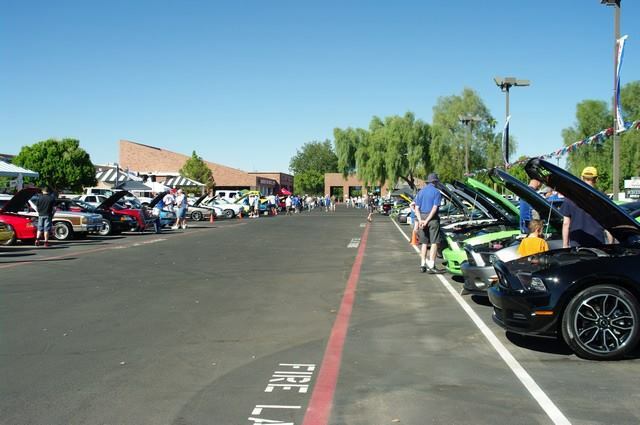 2013 All Ford Show- A Success! 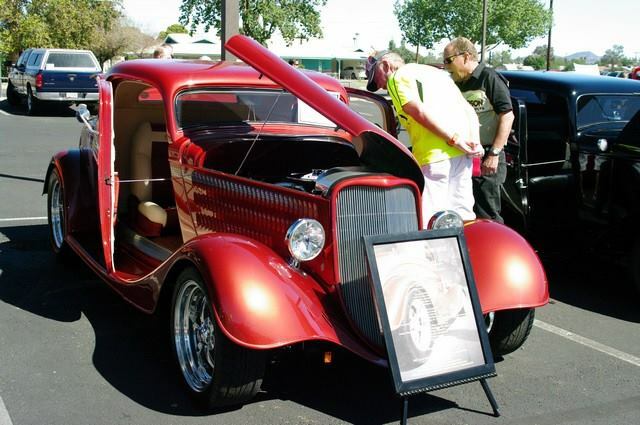 This year’s Sanderson Ford All Ford Show may have been one of the most successful ever. If you didn’t have the chance to come to the Glendale dealership this weekend, not to worry; We have all the scoop right here on our blog. This year we had a total of about 150 cars to show! 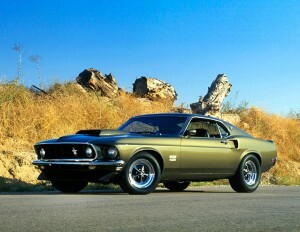 This included a “1 of 3” Concept Mustang Wagon from 1965! It was safe to say that baby was the most popular attraction. 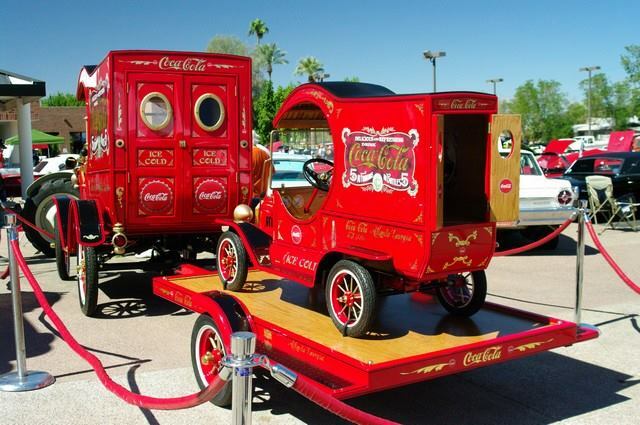 Another popular model this year was the 1917 Model T Coke Truck that was paired with its complementary trailer and mini version. 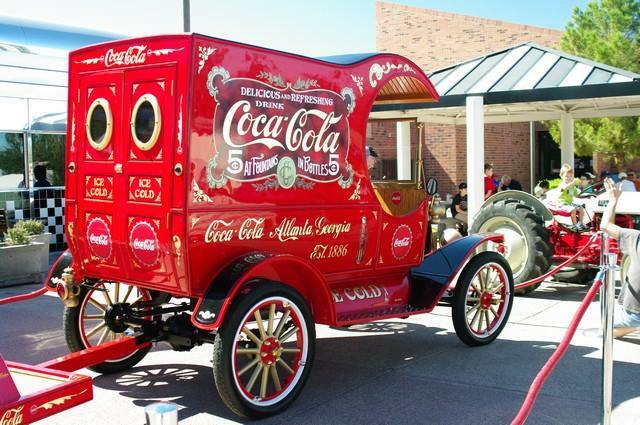 Guests also got to see the newest addition to our Sanderson Ford museum. Another great turn out in the books for our 21st annual All Ford Show. Visit our Facebook page for more pictures of the event. We can’t wait to see you all again next year! 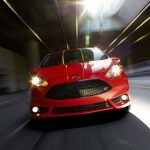 Register Your Car for the Sanderson Ford All Ford Show Today! 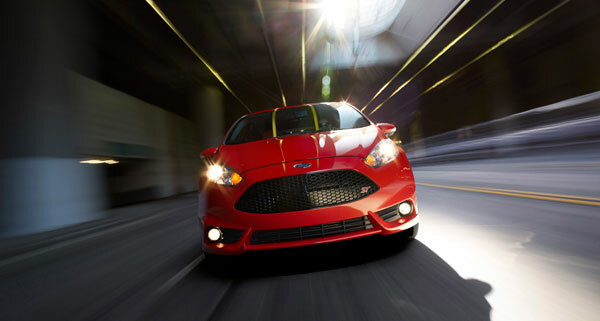 Have you registered your car for Sanderson Ford’s All Ford Show yet? Well, time is running out! If you are interested in showing off your knock-out four-wheeled beauty this year, the registration deadline is September 15th. It’s only $25 to register, and with this entry fee you will also receive a good bag, dash plaque and t-shirt. What’s better than that? Registering is easier than ever. 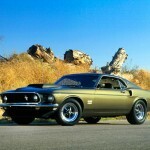 Visit http://www.sandersonford.com/car_shows.aspx and click on the registration form. Print that out and send it to Dave Tedder at Sanderson Ford. The mailing address is located on the form. If you have any questions, feel free to contact Dave at davetedder@sandersonford.com or by phone at (623) 842-8614. 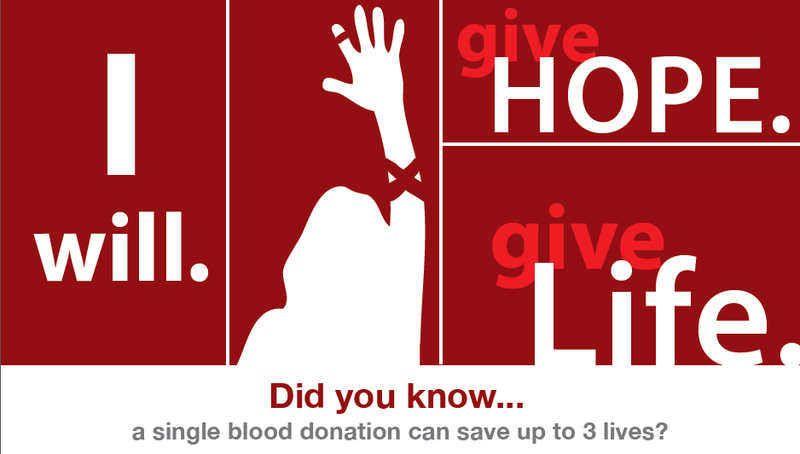 Need another reason to register today? Well, get this. 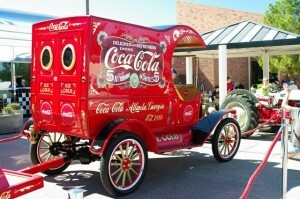 The first 50 cars to register will receive 2 passes to the Village & Museum of Sanderson Ford Tour! Also, if you wait until after the registration date, entry fees jump to $30. What are you waiting for? 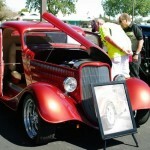 Register today for the 21st Annual Sanderson Ford All Ford Show. You won’t want to miss this spectacular event on October 5th.